After her brief mooring on the River Blackwater, and a tour of coastal resorts between 1995 and 2003, Ross Revenge was berthed at Tilbury Docks for renovation works. At the time no-one could have envisaged that she would stay here for another 10 years. Initially berthed in a public area of the docks she was accessbile to all, only later to be moved to a private berth. During her time in Tilbury much needed works were carried out by a dedicated team of volunteers, many of whom are still actively involved with restoration works to this date. It was during this period that the ships insurance surveyors deemed the iconic twin mast configuration to be unsafe and recommended that the masts were taken down and replaced. 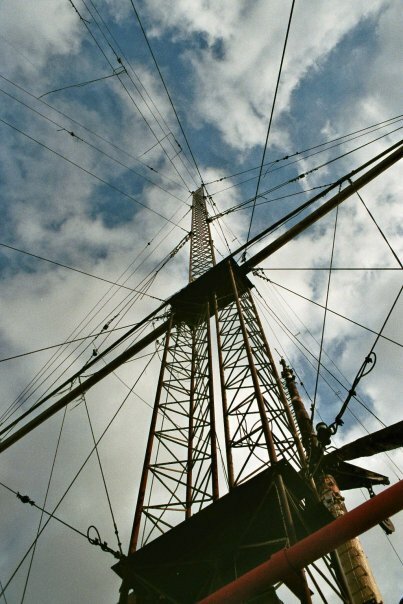 The current Ross Revenge mast was installed during her stay in Tilbury by Radio Structures Ltd. Given the significance of this mammoth task we look at this separately on our 'New Mast page. The list of volunteers who carried out these works was also extensive. We have tried to credit as many of you as we can in the above pages but if we've missed you out, our apologies.